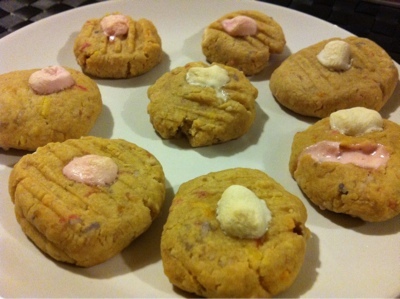 Lotus and Pie: Cookie Dough Cookies!! Don't these little guys look so cute! I got the original recipe from Chocolate Covered Katie and I was inspired to put mini marshmallows into the mix! I don't have spoon measurements right now (but am hopefully getting some this weekend) so it was a bit of a guessing game. The cookies...really...tasted...amazing!